Well, I've had a little free time lately due to Chusuk, and I've been able to catch up on some reading. Having six days off in a row really helped me get back some energy I was missing, and I felt the best I'd been in months after the six days off. Anyways, in case any of you were interested, I'll include a few short descriptions below of some of my favourite books, followed by a short summary of whats happened since my last post. The Tipping Point by Malcolm Gladwell - If you're looking for a book that really makes you think about who you should be talking to if you want something done right, then read this book. I would really recommend educator's reading this book, especially because he writes a lot about Sesame Street and Blue's Clue's, and how they are/were so successful with children - what worked with making children learn more than just by watching. It offers a lot of great insight on trying to make things "stick" with children outside of their school environment. Some of the other major points he covers are who "connectors" are, and to make sure that you know one of them, mostly because they get all of your work done for you, wihthout even knowing it. He writes in very easy prose, and he uses a lot of excellent case studies to highlight his points. A highly recommended read! Last year, I was lucky enough to watch the movie one rainy afternoon, and I immediately fell in love with Che's story. 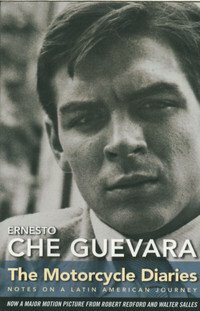 (for an interesting insight for those of you who have read this book, or seen his movie, follow the link over to Slate.com For an interesting read on the current fascination with Che ) I might not have agreed with all that Che's been recorded to have wreaked on Cuba and other revolutionaries, but his book is a fascinating exploration through 1950's South America. Even though it's the english translation (the spanish version is said to include even more details than the english copy) you still get to see a vivid picture of what Che saw on his journey with his close friend Alberto. From some of his insights, you wonder how much insight could have come from someone in the upperclass. He shows a genuine desire to help out, something close to the same feelings most people in their mid-20's want to accomplish; travel, and heal the world, one travelling site at a time... Aside from what you might harbor against Che for his wrongdoings, know that this book is an excellent read, and one that I read rather quickly, because of its ease and readability. 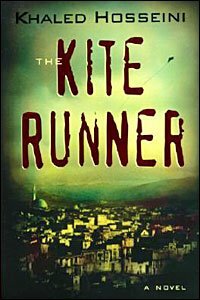 The Kite Runner by Khaled Hosseini This book was recommended to me by a good friend, and I unfortunately forgot about it for a while. I finally bought the book last week, and promptly finished it in three days. Someone used the word "haunting" to describe this book, and I think that that word best summarizes how I felt when i finished the book. Its not haunting in a scary regard, but just in all of the emotions that you read through the book, which Hosseini puts on his pages. The story involves a young Afghan boy and his servant; inseperable even though they live in seperate worlds of social heirarchy. The story offers many interesting insights into the country, things that I wouldn't have known, or bothered to read about in any other book half as interesting as this one. Aside from any other catch phrases, I stayed up late reading this book, because I wanted to finish the book, and read the ending. I highly recommend this book for anyone who's looking for any new books to read. For each of the books, I've included links to websites about each book, in the off chance that you're interested, and want to read someone else's opinion other than mine. If anyone else has read these books, feel free to comment via the comments. Onto other news. The US has just confirmed to South Korea the other day that the test our friendly dictator performed was in fact a nuclear missile, and not a dud like his Taepo-dong missiles he fired earlier in the year. And while he's agreed to meet regarding the sanctions that the UN is threatning to place on him, I'm not holding my breath. Over here, the news has tired about North Korea, and its gone back to how it was before; only when its worthy. Otherwise, the world continues to turn. Oh, and that crashing noise you heard the other day? That was the Korean Won free-falling through the floor, and ruining my exchange rate:) I went from a richer man working here and sending it home, to just plain average. The Korean stock KOSPI opened to pretty much everyone pushing the "sell" buttons. Its leveled off now, but for a bit, it wasn't looking too good. As long as it doesn't dip below the US dollar, then I'll be fine. (Not like I can really do a whole lot about it). Well, today was the day before the start of the annual Chusuk, or Chusok celebration week(end) here in Korea. Chusuk, or Chusok, is the yearly version comparable to Thanksgiving back home. Everyone goes to their families homes, usually their parents, and everyone brings enough gift packages to hold you over for a year. This year, us foreigners lucked out. Starting Tuesday is "National Foundation Day"; its intended purpose withstanding, its a national holiday, so we don't have to work. Wednesday has been pretty much declared a national holiday as well, becuase Chusuk is on the Thursday, and everyone gets the Friday off as well. Yes, we had to work today, but we got to see all of the children get dressed up in their traditional hanbok's, and make their own songpyun cakes (as far as i can recollect, a rice snack that's steamed). The kids were incredibly cute - not only did they look out of place trying to do the normal kids stuff in their nice outfits, but they also seemed to be on extra good behavior. The songpyun cakes were supposed to be in the shape of a crescent moon; the kids saw their cooking material as edible playdough. They made shapes out of this stuff that looked like anything from dinosaurs to as you can see below; a starfish. The festivities at our institute also included games very similar to hackey-sack (only with a plastic tip to hit instead of plastic beads,) and a game similar to lawn darts (with rubber tips) except that your object is to land the darts into a bucket. The kids had fun with all of the activities, and enjoyed the change, even if for most of them, they had no clue what the actual activities were, or why they were dressed up. For the kids, the hanbok's just slowed them down from doing what they normally want to do (which ammounts to making the pre-school teachers earn their paycheck.) They did love however the extra attention they got, and all the compliments that they got from the teachers. The kids were more than glad to get out of their outfits after lunch. As beautiful as the hanbok's looked on the kids, they only wear these outfits twice a year; Lunar New Years and Chusuk. Overall, the day was a great success. I was glad that I had remembered my camera, as I was able to take a lot of really nice photo's of the kids. The rest of my week is looking pretty blank. While the rest of the teachers at my institute are off visiting foreign lands, I decided that its probably in my best interest to take this holiday off, get some rest, and clear my mind. Whenever I travel, I usually go solo, which makes me more tired when I returned. Staying in Seoul however, saves me a lot of stress, and I'm hoping to catch up on some lost reading, devotions, and maybe a little shopping. I hope that all is well with everyone, and that you're all enjoying the fall weather; its gorgeous here right now!